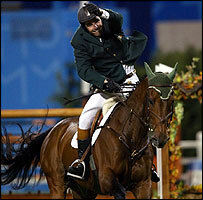 Cian O'Connor's victory in Athens salvaged Ireland's Olympics, bringing delight in the form of an unexpected gold medal. It was a great image, as the 24-year-old showjumper stood on the podium: tears in his eyes, smiling with pride, the medal around his neck. His Irish supporters cheered him and waved their flags. It also brought celebration back home, and instant celebrity for the rider himself. He was feted on his return to Dublin Airport, greeted by Ireland's Sports Minister John O'Donoghue and other well-wishers, and has since appeared on TV shows and the covers of glossy "celeb" magazines. This telegenic, amiable 24-year-old was reaping the rewards of his hard work, and his smile said it all. Now that great night seems a long time ago, after Waterford Crystal, the horse he rode to a stunning victory, failed a drugs test. Mr O'Connor says he is "utterly devastated" at the news. He has repeatedly denied cheating, and insists he would not give the horse anything to make it jump better. "I have nothing to hide, I have done nothing wrong," he says. He has exercised his right to have the second, or "B" sample analysed by testers. He believes the problem stems from medical treatment Waterford Crystal was given well in advance of the Olympics. A vet administered a mild sedative for an injury, which the rider was assured would be out of the horse's system by the start of the Games. Then, weeks later, came the positive test. Since the initial news broke in Ireland, it has been disclosed that another horse ridden by Cian O'Connor, this time in Rome in May, also failed a doping test, testing positive for a banned substance. In an emotional interview on the state broadcaster, RTE, Cian O'Connor passionately repeated his assertion that he had done nothing wrong. He appeared on screen with the vet who had treated his horse. They suggest that tests are now so sensitive that they even pick up on substances that are not performance-enhancing. That, however, may not be enough to save Mr O'Connor from having to return his prized possession. In the interview, he said he knew he was in danger of being stripped of the gold medal. And he said he had worked too hard and too long preparing for the Olympics to jeopardise it all by bending the rules. In Ireland, there is disappointment, as well as a good deal of sympathy. An editorial in the Irish Times was entitled "Olympic Shock". The sport's governing body here, the Equestrian Federation of Ireland, has called for due process to be followed, and warned against what it calls "trial by media". It is likely to take a few weeks before the result of the "B" sample is known. 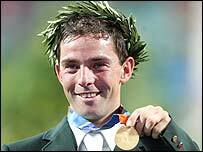 Less than two months on from that glorious night in Athens, when he secured Ireland's only medal of the Games and its first-ever equestrian gold, Cian O'Connor knows that he is in danger of having to hand his medal back.